], it is often cultivated in gardens in warm temperate to tropical regions. Discovering Wild Plants - Alaska, W. Canada and the Northwest. A nice guide to some useful plants in that area. Tropical and warm temperate zones throughout the world, including Britain. Covers plants in Europe. a drawing of each plant, quite a bit of interesting information. 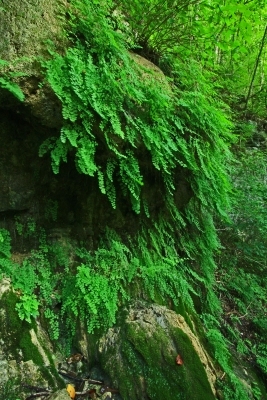 Adiantum capillus-veneris can be found growing wild from the warmer regions of the temperate zone right through to the tropics - its main requirement is moisture and so it is often found growing on wet rocks. Edible wild plants found in Britain. Fairly comprehensive, very few pictures and rather optimistic on the desirability of some of the plants. The Dictionary of Useful Plants. Interesting reading but short on detail. The Useful Plants of Great Britain. Written about a hundred years ago, but still a very good guide to the useful plants of Britain. ]. The fern (does this refer to the rootstock?) is simmered in water for several hours and the liquid made into a thick syrup with sugar and orange water. It is then mixed with fruit juices to make a refreshing drink. Excellent herbal with good concise information on over 400 herbs. ]. The plant is little used in modern herbalism. Contains an article on the medicinal uses of Indian ferns. It can be downloaded from the Internet. ]. Pot on small clumps of plantlets as soon as they are large enough to handle and keep humid until they are well established. Do not plant outside until the ferns are at least 2 years old.